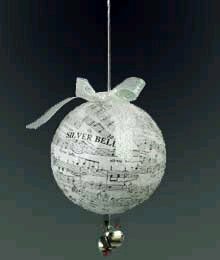 Use Christmas carol sheet music to create a lovely ball ornament perfect for music lovers. These ornaments will encourage friends and family to burst into song! 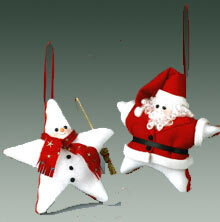 This Christmas carol ornament is a lovely craft that will get you into the spirit of the season. Caroling is a classic Christmas activity that many people wish would become popular again. With this beautiful homemade ornament, the enchantment of Christmas caroling can enter your home once more. Cut title from sheet music and cut rest of page into 1-1/2" squares. Insert wooden skewer into bottom of foam ball to use as handle. Follow manufacturer's instructions to apply decoupage medium to small area of ball and to back of one paper square. Smooth paper onto ball; if paper won't lay flat, cut tiny slits into paper edges and press to ball. Cover entire ball in same way, overlapping paper edges. Trim music title as desired and glue to ball in visible location; place skewer in heavy glass or jar to dry. Apply generous coat of decoupage medium to entire ball; while wet, sprinkle with glitter. Let dry. Remove skewer. Cut 8" length from cording; knot ends for hanging loop. Use skewer tip to make small hole in center top of ornament. Apply glue to cording knot and use skewer to push knot into hole. Tie ribbon bow and glue to base of hanger. Cut two 6" lengths from cording and tie a jingle bell to one end of each length. Place dot of glue into hole at bottom of ornament and use skewer to push cord ends into hole. Glue small bit of greenery to ornament to cover hole. From ornaments that look like candy, to beaded Christmas ornaments to make, to homemade Christmas ornaments that look like Santa and angels, this collection of 48 Simple Homemade Christmas Ornaments has plenty more ideas to choose from! This is a wonderful idea. My daughter in law is a sweet lady but the hardest one to find presents for. She doesn't wear jewelry except for her rings and she us allergic to just about every scent out there, she is nit a kitchen person, so I always come up empty every time I need something for her. This will do the trick. She is a grade school music teacher! How great will thus be for her? Thanks so much for this idea. a very good idea for my music lover friends. I love this one. I will be making these for my musical friends this year. What a great idea and you can embellish them with accents to match the decor of whomever you're giving them to. FABULOUS!! This idea will work fantastic for those old bulbs that the coloring is coming off ofor fading and will make them look brand new. You can also get this spray sealer to spray on them after your done and it will keep them looking new year after year! I paint on glass bulbs and I spray it on them and it works. Everyone in the family gets a new bulb every year for their tree. They love it! @Patches1958 What a great idea! Thanks for sharing! This is great, but an even easier way to make these is to use small balloons instead of balls. Blow the balloon to the size desired, tie a string to the end, hold the end as you work, then hang to dry. Once dried thoroughly, just pop the balloon with a pin! You can even insert bells before covering. I'm a retired teacher and we did lots of projects like this...Easter baskets, bowls, diaramas...you name it. I homeschool my babygrands and we're making some now for shut-ins. You can make lots of things for nursing homes, etc. Also, we mix liquid glue and water to make our paste! You can even add photos or cover the entire ball with family photos for treasured gifts! @nanawood98 ooohhh I love that idea! Thanks for sharing! A box of old Christmas balls were going to get thrown out, but because of this great idea and very good crafting....there is going to be given out as gifts/hung on the tree/look vintage/etc. @Crafter Love it when that happens! :) Another box of ornaments saved! Not only does this seem easy but it speaks to many different papers that can be decoupaged on the balls. Thanks a bunch!